Sandy Ingellis captured this fairly dramatic funnel cloud over Woodbury last Thursday that I blogged about yesterday. This video appears to be what was used as a deciding factor by the National Weather Service to classify a small section of widespread wind damage as tornado damage. 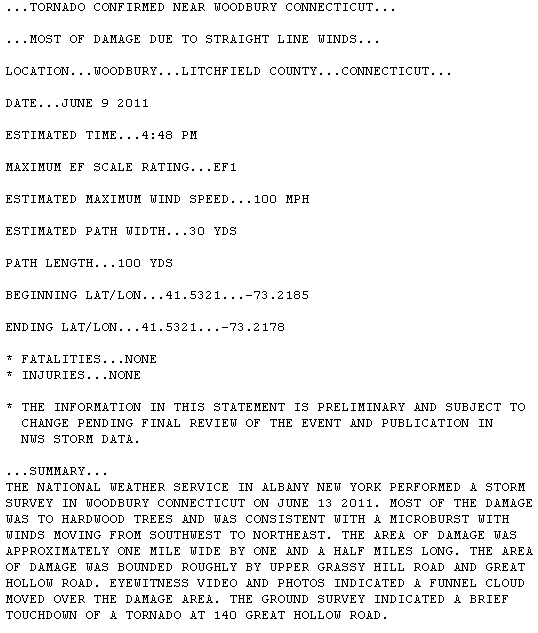 My friend meteorologist John Bagioni pointed out the similarities between the Woodbury tornado and the 2007 Newtown/Bethel tornado that occurred on the northern side of a bow echo racing through Fairfield County. 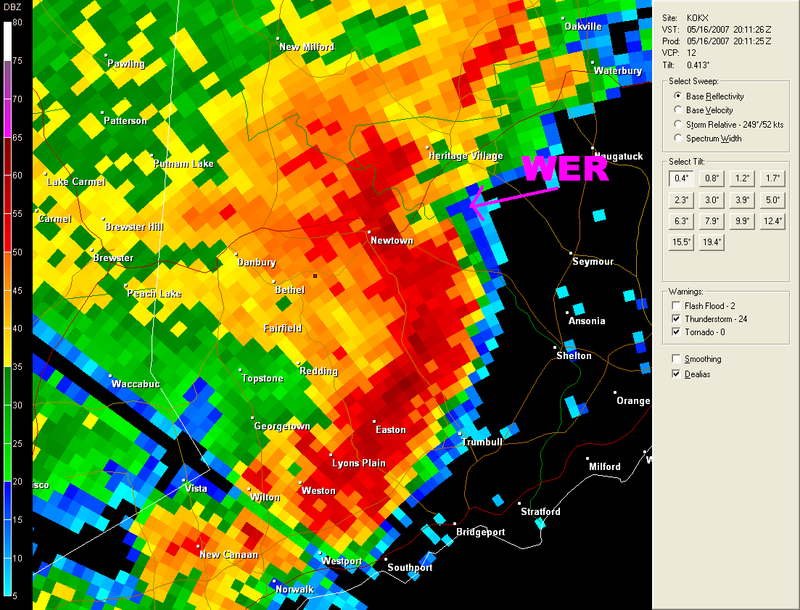 The radar imagery from this event is more impressive and shows a classic bow echo tornado event. The tornado occurred in the weak echo region on the north side of the bow’s apex. In this case the tornado was on the ground for nearly 5 miles and the radar signature was much more impressive than last week in Woodbury. 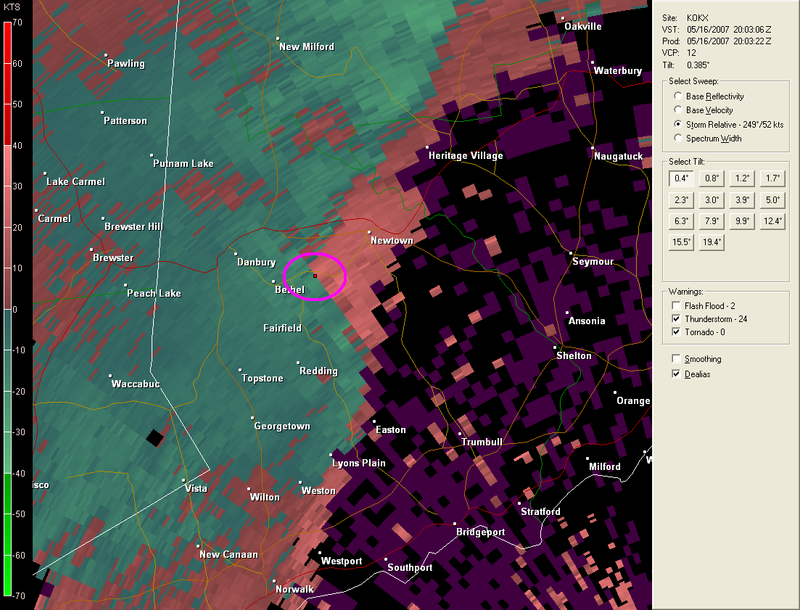 A lot of time these brief tornadoes are somewhat hidden by more widespread wind damage. In the Bethel/Newtown case the damage path was very well defined and fairly significant in certain areas. Last week in Woodbury it was very difficult to determine where straight-line wind damage stopped and tornado damage began. 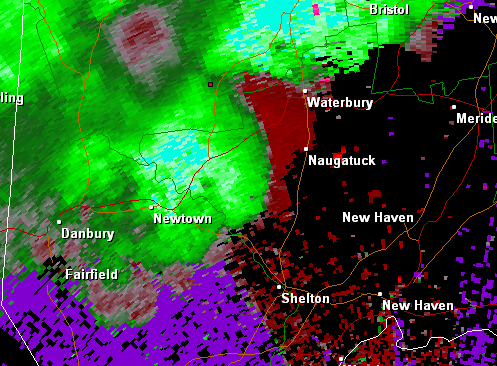 Today NBC Connecticut obtained home video of a funnel cloud moving through Woodbury last Thursday. 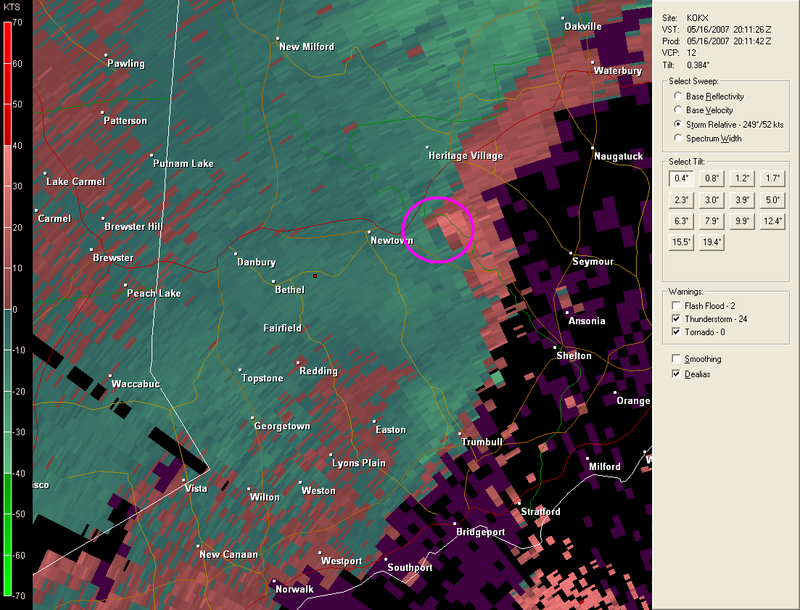 I was surprised but not shocked when I took a closer look at Doppler Radar from Long Island during the event. 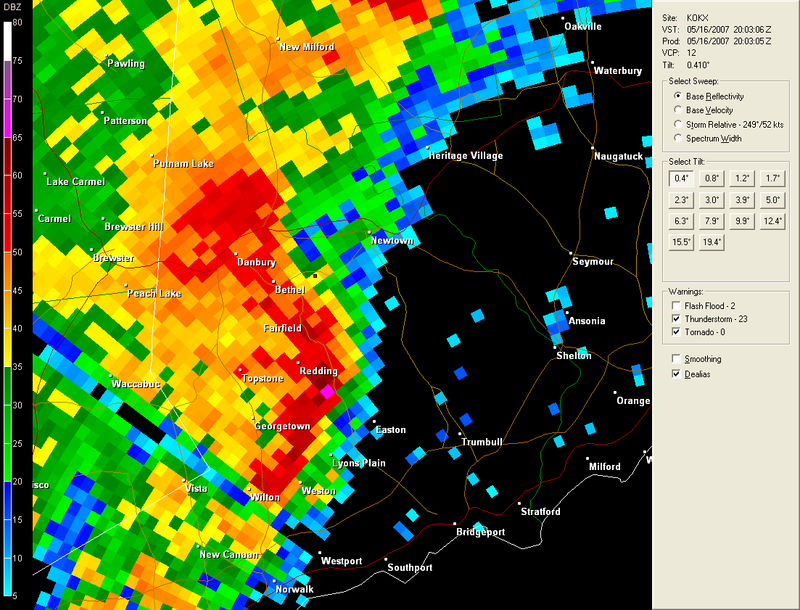 A rather impressive bow echo developed on the Connecticut/New York line around 4:00 p.m. and raced northeast. A Rear Inflow Jet (RIJ) developed behind the squall line forcing the line to bow out. 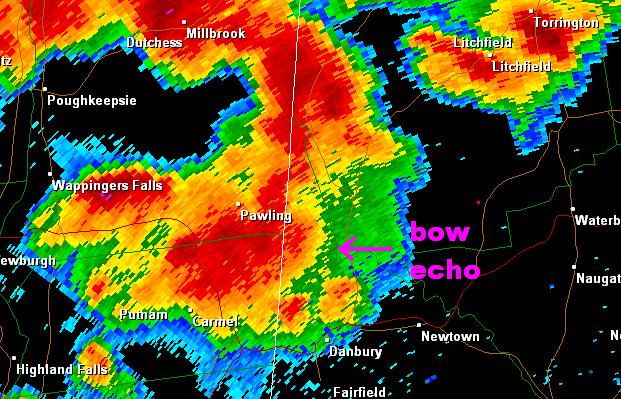 Widespread wind damage was reported in Sherman, New Fairfield, and New Milford from this bow echo. As the bow echo continued east on the northern portion of the bow echo a mesocyclone developed that spawned a brief tornado in Woodbury. 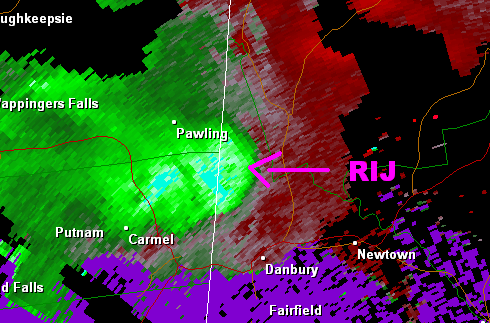 Though Doppler Radar did not indicate a tight circulation or Tornado Vortex Signature this doesn’t rule out the possibility of a tornado occurring. 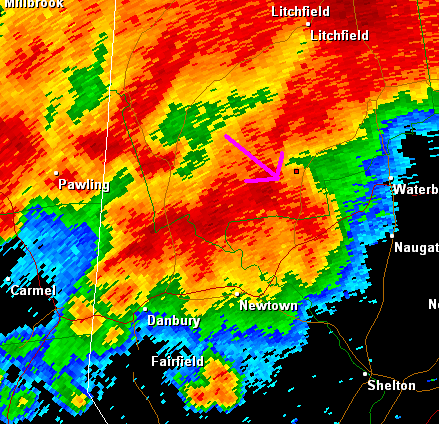 This is not an uncommon occurrence to see a brief tornado touch down on the northern part of a bow echo. The following is a conceptual model of a bow echo from Fujita 1978 courtesy of UCAR. Based on the location of damage reports the Doppler Radar evidence does indicate the possibility of a tornado on the northern portion of the bow in Woodbury.